Home BUSINESS MTAANI NEWS A near bloody clash erupts as residents clash with thriving irrigation farmers over upstream blockage of river. A near bloody clash erupts as residents clash with thriving irrigation farmers over upstream blockage of river. Some residents share dirty water trapped in a pan at River Ndarugo with their livestock on Monday morning (left) as their colleagues stare at a dry river bed as a result of large-scale irrigation upstream(right). Some quick intervention from the office of the Thika Town MP, Eng. Patrick Wainaina, prevented a bloody conflict between the residents of Munyu and Komo areas on one side and some thriving irrigation farm owners who had blocked River Ndarugu upstream, leaving the residents without water for more than a month. 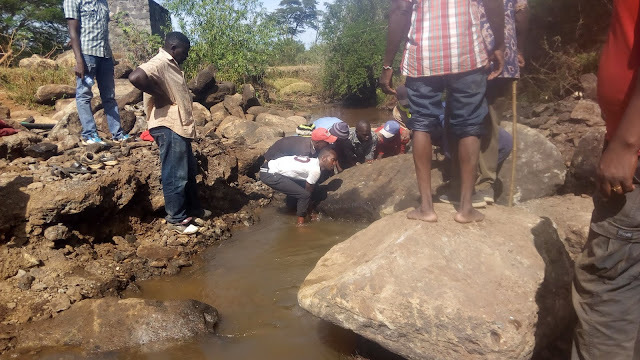 Armed with crude weapons, more than 100 residents travelled for more than 10 kilometers to Juja Farm, Ndarugu and Nyacaba areas in Juja Constituency forcefully unblocking sections of the river where these farmers had diverted the water into their farms. In total, they unblocked about six water points that had completely cut off the water flow, leaving the areas downstream without even a drop of water. At one point, one of the farmers had completely blocked the river with very huge boulders which neighbours claimer were deposited on the course of the river using trucks and bulldozers. It took the effort of more than 30 youth to at least remove a few rocks in order to allow the water to flow downstream. 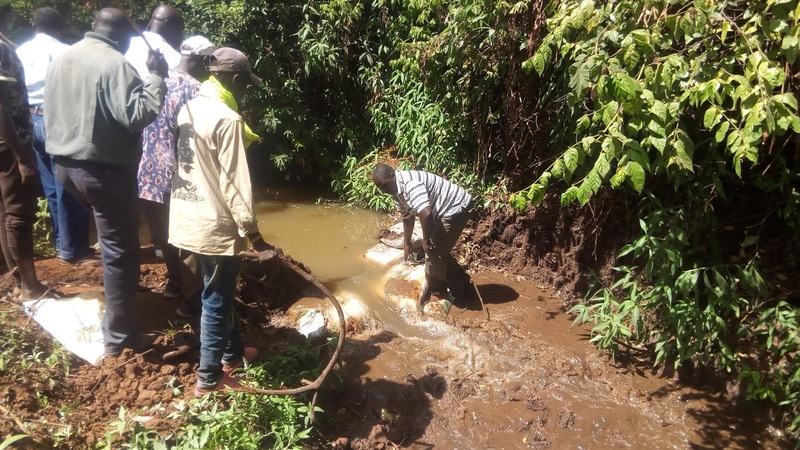 The residents trying to remove huge boulders that had been deposited into River Ndarugu to block the course of the river and enable one of the farmers irrigate his farm. In another spot, the ungrateful farmers had clogged the free outlet at a water point left for water flow especially during the dry seasons with stones and about a hundred sacks filled with sand, leaving not even a drop flowing downstream. Contrary to the scenes downstream where we witnessed people sharing dirty water with livestock, areas upstream were green and full of life with farmers owning over a hundred acres of land engaging in large-scale irrigation farming. 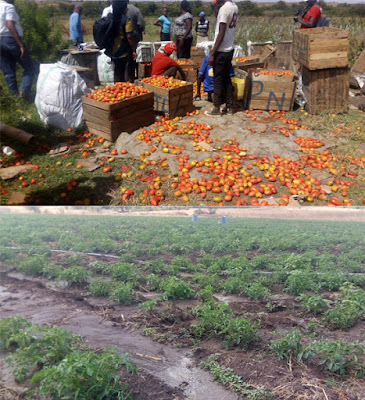 One farmer in particular was said to be the biggest supplier of tomatoes in Githurai market with another one supplying trucks of cabbages and other vegetables to the same market and Marikiti Market in Nairobi. One of the farmers in Ndarugu area forced to unblock River Ndarugu to allow water flow downstream. 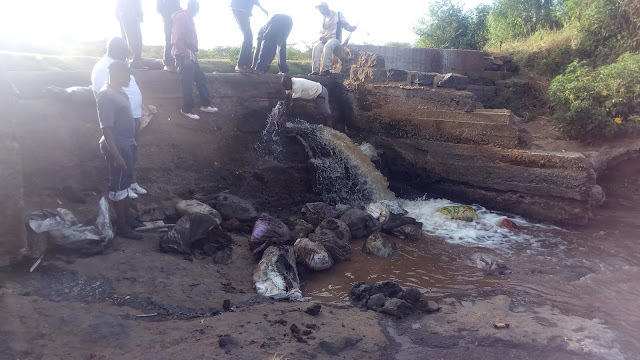 The residents of Komo, Githima, Munyu, parts of Gatuanyaga and Magana areas lamented that ever since these farmers blocked the water upstream, life has been so unbearable especially to nursing mothers and those who reared poultry and other livestock. “Ever since our people were settled in Munyu village in 1968, Ndarugu River has never dried up and has been always our source of water even during the dry season. Now these people have blocked all the water just to earn millions at the expense of the lives of all the people living downstream,” lamented Joseph Kiboro, a resident of Munyu. The residents accused the Juja farm chief of colluding with these farmers, allowing them block the water and intimidating anyone who threatened to interrupt with these farming activities. Some of the irrigation activities at one of these farms and bumper harvest being packed for the market. They said that life downstream was a living hell as they were now being forced share unclean water remaining at few water pans on the riverbed with animals, exposing them to an outbreak of waterborne diseases. “To get a jerry can of clean drinking water now is costing us between sh. 70 and 100 as it has to be collected from as far as Muguga and Makongeni areas. This is way beyond the reach of most of us here who are merely casual workers in quarries and institutions around here,” explained Rose Ndinda who was born in Munyu in 1960. Ndinda said that she has never experienced a situation like the one they were in ever since she was born. “It is rather unfortunate that even after our MP (Eng. Wainaina) donated a water pump to help us draw water from the river, we still cannot access the precious commodity due to the actions of a few greedy people who have blocked this water upstream,” she added. The residents unclog one of the water points that had completely locked out the flow of water downstream at River Ndarugu. The Personal Assistant to the area MP John Mwangi Njuguna and the MP’s legal Advisor Chege Gathu who represented the MP said that the residents called them seeking solution to their problem and after learning of the tension in the areas affected, they decided to respond immediately just to quell any possible skirmishes or damage of property. Otherwise, they supported the residents’ resolve to unblock the water saying that it was illegal for anyone to block river water for their own individual use without considering the fate of those living downstream. After more than eight hours of toiling, the residents went home happy as the water streamed downstream with velocity, a sign that their hard times were over.